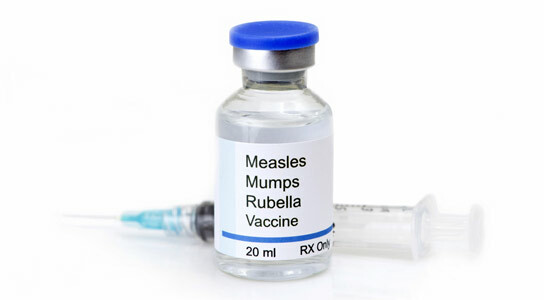 A newly published study involving 95,000 children reveals that the measles-mumps-rubella vaccine was not associated with an increased risk of autism spectrum disorders, regardless of whether older siblings had ASD. The findings indicate no harmful association between the receipt of MMR vaccine and ASD even among children already at higher risk for ASD. Although a substantial body of research over the last 15 years has found no link between the MMR vaccine and ASD, parents and others continue to associate the vaccine with ASD. Surveys of parents who have children with ASD suggest that many believe the MMR vaccine was a contributing cause. This belief, combined with knowing that younger siblings of children with ASD are already at higher genetic risk for ASD compared with the general population, might prompt these parents to avoid vaccinating their younger children, according to background information in the article. Anjali Jain, M.D., of the Lewin Group, Falls Church, Va., and colleagues examined ASD occurrence by MMR vaccine status in a large sample of U.S. children who have older siblings with and without ASD. The researchers used an administrative claims database associated with a large commercial health plan. Participants included children continuously enrolled in the health plan from birth to at least 5 years of age during 2001-2012 who also had an older sibling continuously enrolled for at least 6 months between 1997 and 2012. Of the 95,727 children included in the study, 1,929 (2.01 percent) had an older sibling with ASD. Overall, 994 (1.04 percent) children in the cohort had ASD diagnosed during follow-up. Among those who had an older sibling with ASD, 134 (6.9 percent) were diagnosed with ASD, compared with 860 (0.9 percent) diagnosed with ASD among those with siblings without ASD. The MMR vaccination rate (l dose or more) for the children with unaffected siblings (siblings without ASD) was 84 percent (n = 78,564) at 2 years and 92 percent (n = 86,063) at age 5 years. In contrast, the MMR vaccination rates for children with older siblings with ASD were lower (73 percent at age 2 years and 86 percent at age 5 years). Analysis of the data indicated that MMR vaccine receipt was not associated with an increased risk of ASD at any age. “Consistent with studies in other populations, we observed no association between MMR vaccination and increased ASD risk among privately insured children. We also found no evidence that receipt of either 1 or 2 doses of MMR vaccination was associated with an increased risk of ASD among children who had older siblings with ASD. As the prevalence of diagnosed ASD increases, so does the number of children who have siblings diagnosed with ASD, a group of children who are particularly important as they were undervaccinated in our observations as well as in previous reports,” the authors write. This project was funded by the National Institute of Mental Health, National Institutes of Health, and the U.S. Department of Health and Human Services. Please see the article for additional information, including other authors, author contributions and affiliations, financial disclosures, etc. In an accompanying editorial, Bryan H. King, M.D., M.B.A., of the University of Washington and Seattle Children’s Hospital, Seattle, comments on the findings of this study. 2 Comments on "New Study Reveals No Association Between MMR Vaccine and Autism"
Are the scientists who did the research that found no association between vaccines and autism also under the pay of the drug companies who make the vaccines? Given the control industry has over federal agencies and the well documented corrupt science of the drug industry I think this is highly probable. Even large studies can be made up of cherry picked smaller studies from an even much larger pool of small studies bigger than the meta-study in question. It’s easy to pick out a minority of studies that support you view. Get out of your science journals and start researching on the alternate news section of the Internet not owned by the Fascist oligarchy of super billionaires and wake up out of your materialist stupor of an attitude that wants to see the material human universe as being more stable than it is. So sad that these scientists were found to have fabricated results and been paid for their research. I guess the legal teams will deal with them and their labs in due course.